A couple of months ago, I learned Mrs Smith was to retire. Mrs Smith taught me when I was young, perhaps five or six years old, and not for more than a year or two because we moved to another town. More than 20 years later, you ask me which of the educators had the biggest impact on my life, I’ll tell you it was Mrs Smith. She had a way of understanding each and every person in the classroom, and spoke to us as though we were teaching her. When I learned of her retirement, I took a moment to reminisce – a word I remember Mrs Smith teaching me. I went to the basement to browse through some of the notebooks that I have kept as I moved in and out of eleven different homes in three different countries since I learned to write. For a few short moments, as I looked at Mrs Smith’s handwriting correcting my own, I was that little kid again. Some people are born to teach, Mrs Smith is one of them. My wife is another. Almost every spring break, winter holiday or vacation season, we’re blessed to have a former student from one of my wife’s classrooms visit our home. In the four years we have been married, students have visited us in Jerusalem, Los Angeles and now Kansas City. Many have visited our home more than once and I have been able to develop a friendship with them too. Some have married and now have children the same age as our kids. That mentoring relationship returns as they turn to us for our point of view of parenting. I love these visits and the chance to watch student-and-teacher reconnect. This afternoon, Ali, a former student from Boston landed in Kansas City and she’ll be visiting through Sunday. Over dinner, she shared her plans to major in Elementary Education of the Deaf and Hard of Hearing so as I write, we’re watching “Sound and Fury“. Tonight, the student becomes the teacher. I want to dedicate this post to the teachers of the world. The people like Mrs Smith, my wife and Ali, who will always selflessly devote their lives to education. As long as teachers are teaching, I’ll be cooking. Welcoming Ali to Kansas City, it was a Taco Tuesday dinner. You can use this taco seasoning whether or not you’re making a vegan/vegetarian dish. Consider this a replacement for those little packets of taco seasoning you pick up at the grocery store. For the health conscious, that there is no sugar in my homemade taco seasoning. 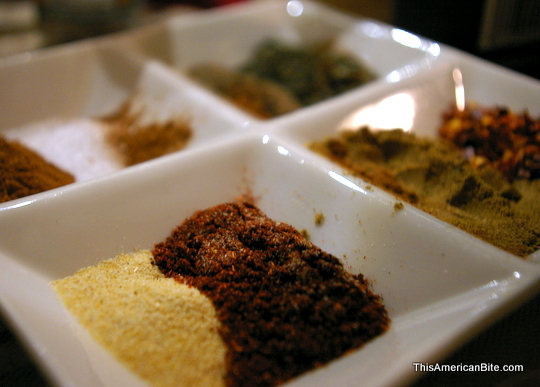 If you make tacos often, you may want to make a big batch of this homemade taco seasoning and keep it in an air-tight glass gar. It is easy to scale up and down as you use equal parts of all ingredients. *If you are doubling the recipe for a larger batch, be careful not to over-salt the mix. I haven’t tested larger batches but my instinct is telling me 1 teaspoon of salt is plenty even if making a quadruple batch. Once you have made your taco seasoning (above) you will need the following ingredients for vegetarian tacos. The meat is actually vegan. This vegetarian taco recipe is quick and simple – and adaptable if you’re using beef and not a meat replacement. 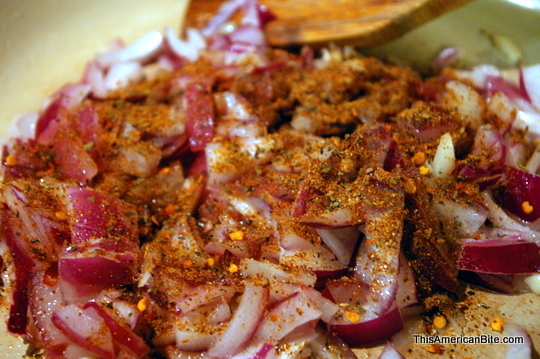 Start by dicing one red onion and three cloves of garlic. Put a teaspoon of coconut oil into a skillet on a medium-low heat. Once the oil is warm, add the onions and garlic to the skillet and sauté for three to five minutes, until soft. If you do not have any coconut oil, you can substitute for a different cooking oil but I would recommend buying some and starting to use it in your cooking. If you live near a Trader Joe’s, you can but it there for about $6 a jar. 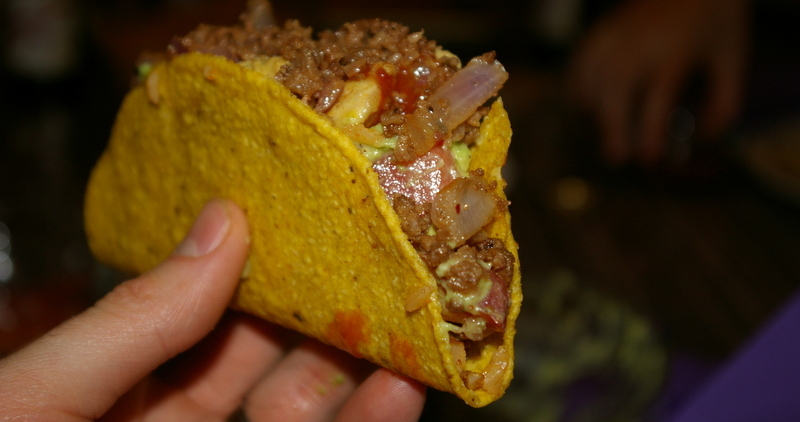 Once your onions are soft, sprinkle lightly with one tablespoon of homemade taco seasoning (scroll up for the recipe). Mix and allow to cook for two to three minutes more. The aroma of the spices will come to life as they start to cook. Mix one more time so all the onions are covered, then add your veggie-meat. 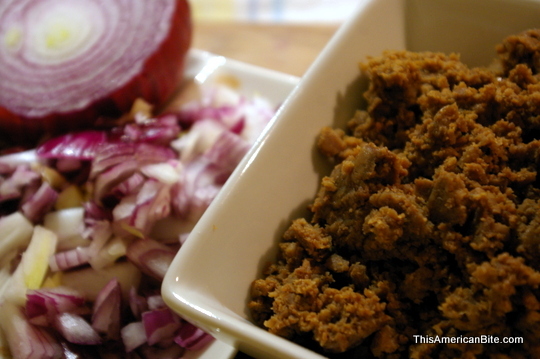 Many vegan-meat crumbles are pre-cooked so stir the ingredients so the seasoning, onions and meat combine. Allow the meat to cook for seven to ten minutes then drizzle with a tablespoon of extra virgin olive oil for flavor. Serve right away, or store in an oven-safe dish. If re-heating, pre-heat the oven to 250 degrees and set in the oven for up to fifteen minutes (that’s not a typo, you don’t want the oven too hot or the meat will continue to cook). Before you ask, I don’t know if you can microwave this – I hate microwaves – but if you must, reheat in 30 second increments to make sure you don’t dry out the taco meat. Part of the beauty of Taco Tuesday is the family style nature making and eating tacos. Think about your perfect taco and make sure you have those fillings. 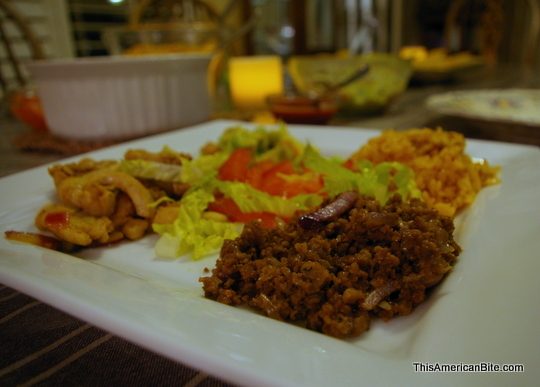 On the table tonight, we had Spanish rice, guacamole, shredded lettuce, diced tomatoes, hot sauce and chicken strips for the meat-eaters. You could also consider re-fried beans, salsa or pico de gallo, this is your opportunity to make the dish your own… just don’t forget to buy taco shells! 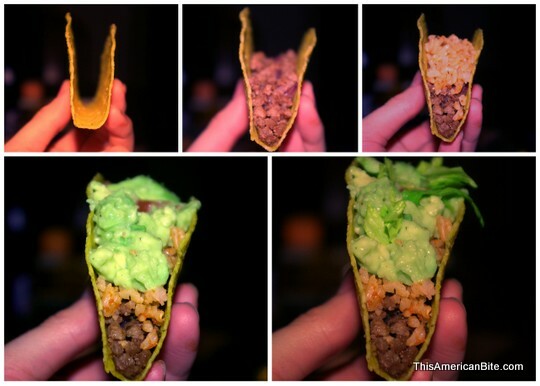 One tip for assembling the tacos. Put all your fillings of choice on your plate before you start to assemble your taco, that way you’re not holding a taco full of rice and meat in one hand and asking for someone to pass the guac in the other! Hold your empty taco shell in one hand. 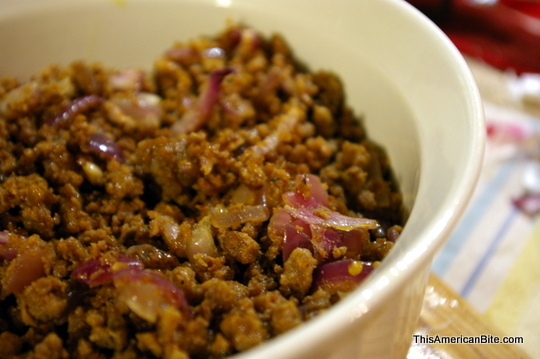 Add a layer of (vegan) ground beef. 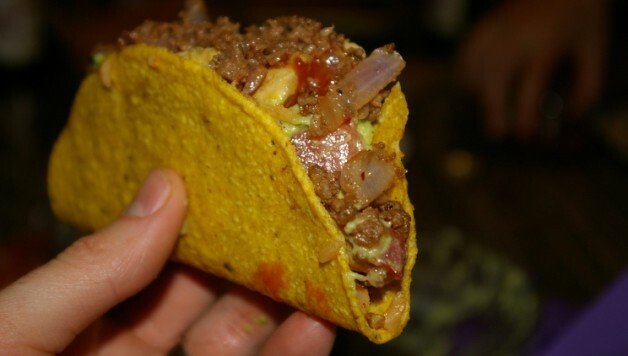 You can pat it down with your fork so it doesn’t fall out when you lift the taco to your mouth, but don’t push too hard, you’ll crack the taco shell. Then add a layer of rice, followed by guacamole, hot sauce and veggies for garnish. Pace yourself, these are more filling that you’d expect. An ice cold beer is the perfect compliment to a taco dinner.